We got married on St. John on October 24, 2002. We returned to St. John for a week almost every October for our anniversary. After a few years, we prioritized and expanded to 10 days, then 2 weeks in October. That 'new plan' only lasted for a year, when we decided to come for 1-2 weeks in March as well (switching between Grande Bay Resort and Great Expectations). 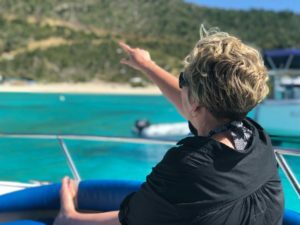 For the first 9 years visiting St. John, we'd gone out on 'shared' boats, like Calypso or Bad Kitty, with 1-2 dozen people we didn't know, but we never even thought to do a private charter. A few years ago, while on-island with Carrie's brother, Wally, and his wife Toni, we were hanging at Joe's Rum Hut after a 7+ hr beach day at Maho or Jumbie enjoying a happy hour drink. 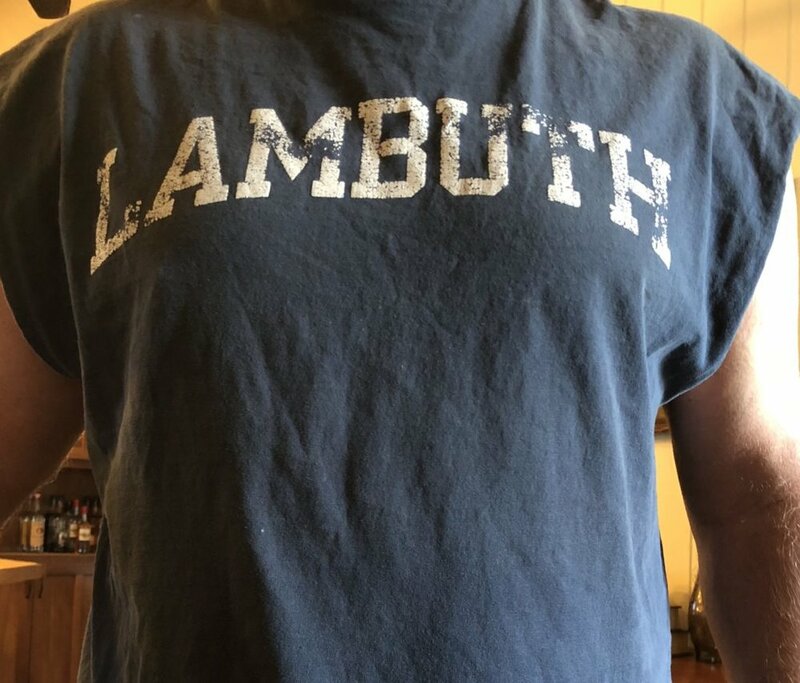 Wally looks over at a guy's t-shirt and says "LAMBUTH" out loud. You see Carrie (and Wally and Toni) are from West Tennessee. Lambuth is a small university only 30 minutes from their farm. Guy: "What?" Wally: "I said Lambuth!" Guy: "Yeah, it's a small college from our hometown, Jackson, TN." Wally: "Jackson!?! Heck, the 3 of us grew up in Brownsville. I work in Bells." Blah blah blah, small world, washed down with rum punches and Red Stripes. The next thing you know we have 2 new friends in Jimmy & Bridgett Key, fairly new owners of Palm Tree Charters. A few days later, we get a call from them asking if we want to go watch a sunset on their boat, Palma Bella, while moored in Caneel Bay. We had 2 hours of relaxation - chatting, sipping, swimming, singing, dancing, and taking sunset photos. We learned something crucial that night: Bridgett likes classic country. Not classic as in Garth Brooks or Alan Jackson. We're talking George Jones, Merle Haggard, and Conway Twitty. And she's not afraid to gather a group of people to sing it out loud. Good times! cruised over to Norman Island for some snorkeling in the Caves and the Aquarium. From there, Jimmy & Bridgett took us to Sandy Spit, Foxy's Taboo for lunch, then over to White Bay on Jost Van Dyke. 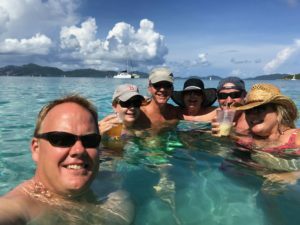 Our 14th anniversary trip to St. John in October found us staying at Grande Bay and booking a new type of trip with Jimmy & Bridgett: rather than motor around the BVIs, they suggested that after we checked into customs, we head straight to Peter Island and visit Peter Bay Resort. While the resort has guests staying there, if you throw a few bucks around at the bar or restaurants, they welcome day visitors. This past February, we'd owned Great Expectations for a little over a month, and scheduled a 'working' trip. We chartered with Jimmy & Bridgett for 2 trips to White Bay with 2 of our fellow Soggy family from Pennsylvania. We started off by checking into customs on Jost in Great Harbour and enjoyed a tasty breakfast of pate at the newly rebuilt A&B. We stopped into Foxy's for a morning refreshment, then headed straight over to White Bay to spend the whole day there and see some of our other 'family' we stayed with at Sandcastle Hotel every March. 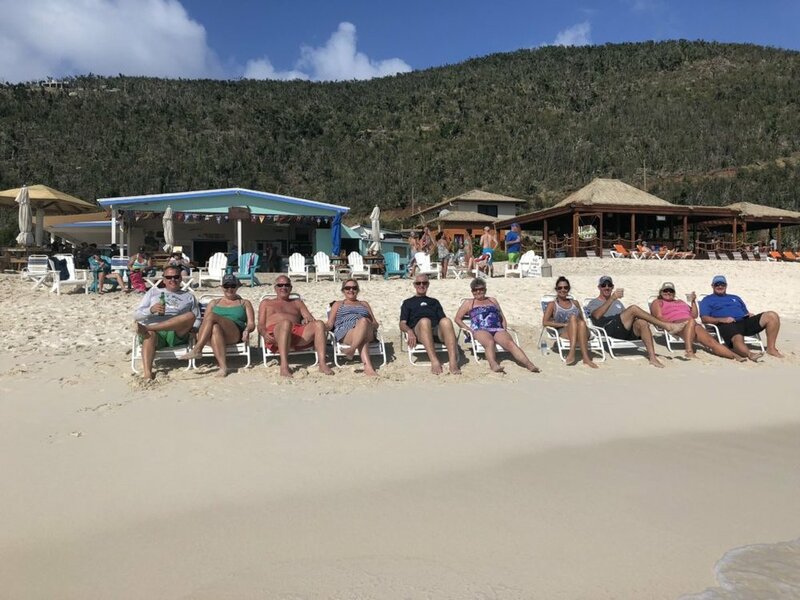 Great Harbour and White Bay on Jost van Dyke are really coming back fast, with dozens of new palm trees planted and multiple bars & restaurants open again. We were there with another 12+ day charters and as many sailboats - maybe 120-140 people in total. With over 27 visits under our belt (8 in the last 7 months), we try to get out on the water every time we're on the rock. It gives us a perspective of St. John and the Virgin Islands that you can't get by driving up to a beach. Maybe it's the fact that the Keys make a point of ensuring that you do nothing but relax. Sure, we've had great trips with Residensea, Ocean Runner, and others, but we keep returning to the Keys. Pun intended! As villa owners, we want to make it possible for you to get out on the water during your stay at Great Expectations. We're committing $100 toward a day charter with Palm Tree Charters to each group of guests who stay with us for a week or more. If you haven't tried it, you should. If you have day chartered, you really should try a trip around the Cays with the Keys.